Hieronymus Bosch lived and worked at 's-Hertogenbosch where he was born into a family of artists coming originally from Aachen. He was introduced into high society, where he received commissions from prestigious persons. Bosch is known for his works peopled with demonic beings, revealing an exceptional independence from the pictorial tradition of his time. 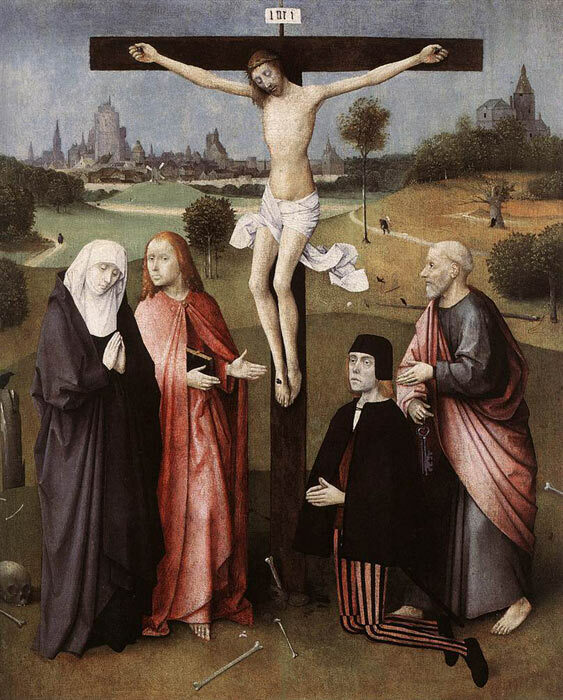 However,the Crucifixion with a Donor by Bosch , which is attributed to him, is perfectly in line with the iconographic tradition of the 15th century. Crucifixion with a Donor shows a sort of hierarchical intercession procedure. The kneeling donor is praying for his salvation. He is accompanied by his patron, St Peter, identified by the key in his hand. Turning towards St John the Evangelist, St Peter presents his protégé. St John then looks towards the Virgin, asking her to intercede with her Son, which she does by praying. Christ figures on the cross as a sign of redemption, his sacrifice having made possible the salvation of the human race. The scene is portrayed in the place reserved for the torture of condemned criminals, on the edge of a Brabant city which is visible in the distance. Midway, a broken gibbet lies on the ground, surrounded by scattered bones and crows. Bosch displays some figures walking along the paths leading towards a mill to the left and a castle to the right. The donor's identity is not known. Only his first name, Peter, is indicated by the presence of his patron saint. He is dressed in a white shirt and a brown pourpoint. Over this he wears a black cape and a hat on his head. His legs are dressed in striped black and red breeches and stockings decorated with the same motif. A sword shows out from under the cape. This costume, which was worn in the Low Countries during the last 20 years of the 15th century, could indicate that the donor was in a lord's service. We do not know whether this panel - Crucifixion with a Donor originally had wings. No other crucifixion by Hieronymus Bosch is known, although the theme returns as a secondary motif in others of Bosch paintings. It is also one of the master's few works containing a donor portrait. The style displays a striking balance and serenity. The flesh colours of Christ's body are softened and the draperies sober. The countryside shows a very gentle gradation of greens, producing a successful effect of depth. SPECIAL NOTE : The painter will make the reproduction as close to the original oil painting as possible. If you want your painting to alter from this likeness, please email us and " Crucifixion with a Donor, 1480-1485 " will be reproduced according to your special requirements.